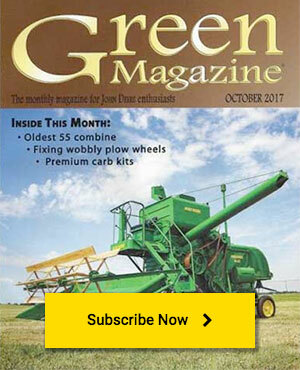 Maybe we should have titled this article, “Stuff you’ve tripped over.” Shown here are some things that you probably never knew Deere sold and most likely wouldn’t recognize if you saw them lying around in a junkyard. No, they are not what they look like. Not some sort of shields to keep dirt from flying up behind the disc, though they may also serve that purpose somewhat. They are actually weights that bolt onto the gang frame of a “KBA” or “KCA” for increased penetration in hard ground. I’ll bet that if you found one of these complete, and new in the box but without instructions, you would never figure out how to hook it up even if you knew it fit on a 1400 series offset disc. It’s a turn attachment that makes it possible to make turns with the disc without stopping or slowing down. 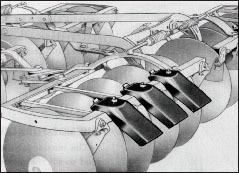 As the tractor begins to turn, the angle between the tractor and disc causes one of the cables to be pulled on. The tension unlocks a mechanical latch, permitting the gangs to close for the turn. When the turn is complete, the gangs automatically return to the pre-set position. Orchard tractors are highly sought after by many collectors today and if you’re restoring an orchard tractor, good sheet metal can be very hard to find. Here are some orchard fenders that, most likely, no one has ever spent time looking for because they fit a “CC” field cultivator. 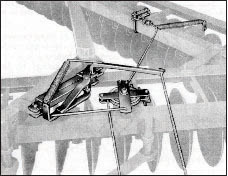 Placed over the wheels and end teeth, they keep branches and fruit from damage. This lift crane for a No. 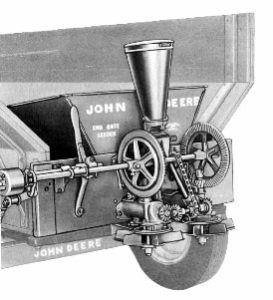 45 loader was said to be perfect for carrying bulky objects such as posts, feed bunks, water tanks and hog houses. It probably would be a handy item so long as you had plenty of weight on the back of the tractor and the use of a lot of common sense when it came to what to lift and where to go with it. The W-6 Warehouse sheller was basically the cylinder section of a No. 6 truck sheller. It was designed for stationary applications in grain elevators or seed corn plants. Powered by a 25 horsepower motor, it could shell 600 to 1,000 bushels per hour. OK, you would all probably recognize this broadcast seeder if you saw it sitting around somewhere. But I couldn’t resist showing it to you so that you can remember how much fun it was riding in the trailer, scooping grain or fertilizer into it while your dad drove the tractor ahead of you. For those of you who have never had the pleasure, it is run by the steel chain (barely seen on the left) which connects to a large sprocket mounted on the trailer wheel. The big hopper is for larger seeds like oats, the small one for smaller seeds such as alfalfa and clover.